Pam’s Pictorama Post: Sam 3 mts. old it says on the back. This cat is a hot number. This appears to be taken on the deck of a large ship. Sam is clearly a perky fellow, and he is mesmerized trying to catch that mouse toy. This is British, no date – a photo, not a postcard. I love the suited arm that is reaching into the photo. A man in a suit having his photo taken on board a ship, playing with Sam the cat! Cats standing on their hind legs could be their own genre. 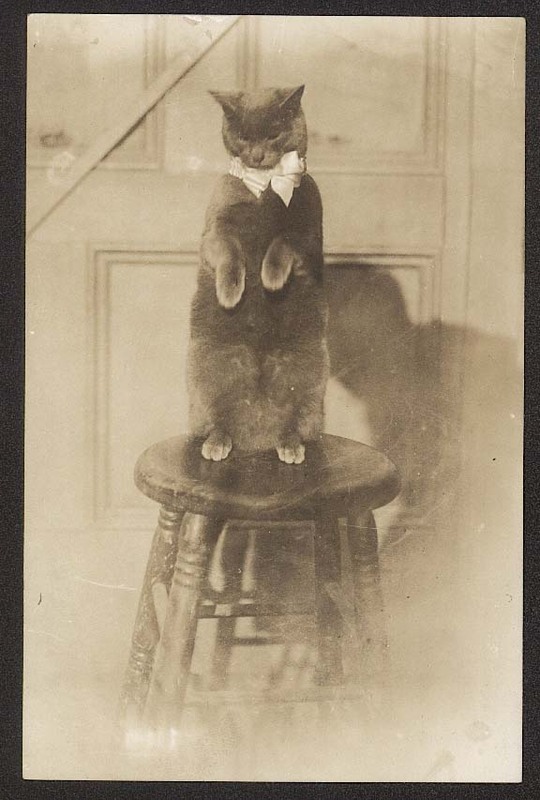 This one below is a photo I have owned for quite a while – a cat preparing to stand for a cat treat. Not as young or as sporty as Sam – this fellow is a tad stout from those treats. This time a mysterious female arm. 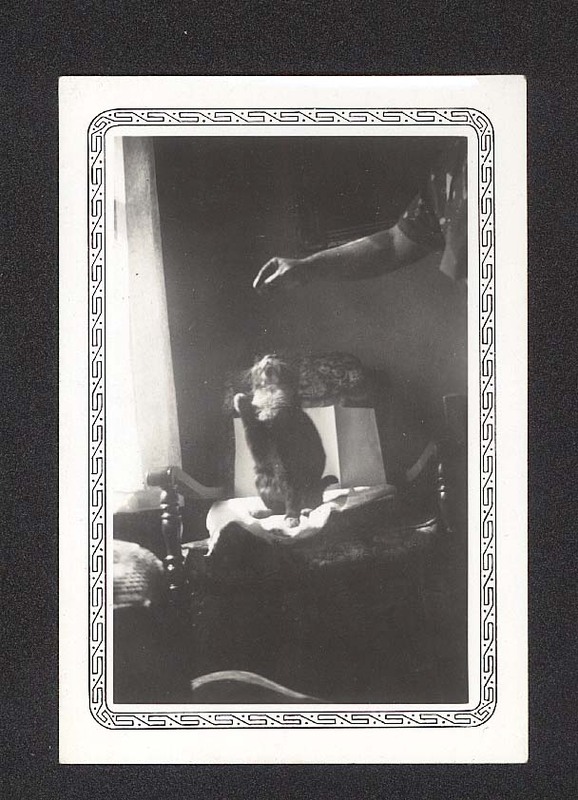 (The humans are always on the edges of these photos – an arm, a shadow.) Although this looks like a photo postcard and has those dimensions, it is a lighter paper. Nothing on the back. I do not remember where this came from, but I am fairly certain it is from the US. I bought it because at the time we had a beloved cat, Roscoe, who was a fiend for cat treats and would catch them in his mouth if pitched. It reminded me of him. We aren’t quite sure what they were doing to encourage him to stand up but clearly he isn’t happy about it. Cookie and Blackie are the most standing up cats I have ever had. Kim and I have speculated that it is an evolutionary aspect of cats. I don’t believe I have captured this in a photo so I will have to work on that. Mouse toys at the ready!